They are said to prevent witches from flying down the chimney by placing a St Andrew’s cross on one of the fireplace posts. 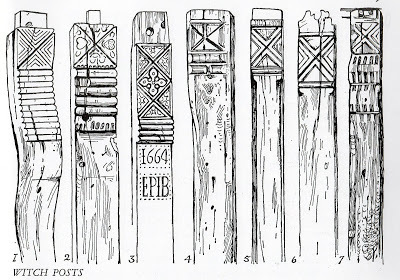 This drawing of other examples don’t always look like a St Andrew’s cross to me and the true meaning of the symbols and history of the tradition seem to have been lost. The other examples do all feature prominent diagonal crosses which is St Andrew’s main signature in iconography – supposedly he asked to be crucified on a diagonal cross as he didn’t conciser himself to be worthy of the same type of cross as Jesus. I presume that as long as there’s a diagonal cross it will still have the mojo to prevent witches so that’s what would have been done first – as in the photo. After that people would have elaborated on it to make it look nicer in their living room.